Over the past year, we’ve been evangelizing – sharing the good news about businesses taking control of online data. And we dedicated lots of resources to educating businesses and brands, teaching them how to take control of their data. We even created a music video “I’m All About That Data” to teach awareness on the importance of the issue, in a fun way. Let’s explore some important facts. Did you know…? 56 percent of mobile searches have local intent when consumers are on the go? 69 percent of consumers expect businesses to be within five miles of their search location? 73 percent of consumers said they lose trust in a local business when it has inconsistent location data? 61 percent of mobile searches result in a phone call? Did you know when Google says mobile they’re not referring to tablets, they only mean smartphones? According to Google’s announcement last year, mobile search has overtaken desktop search. Think about that. Consumers are searching mostly from their smartphones when it’s time to make a purchase or select a service. So What Does This Have to Do With Advice Local? Everything. Well ok … maybe not everything, but everything local digital presence management (LDPM). LDPM is the convergence of local presence management and digital presence management. From managing a business’s directory listings to citation cleanup, building a website to content and SEO strategies, paid search and social media, all of these make up a business’s or brand’s local digital presence. And Advice Local takes care of it all with our LDPM solution. The best part is Advice Local is live and ready for you to visit right now! Click around to see what’s new and while you’re there be sure to run a free Online Visibility Report or schedule a demo. 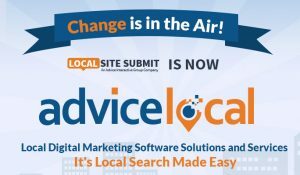 Welcome to the world of Advice Local, it’s local search made easy! Home BlogEverything’s All About Local… Advice Local That Is!